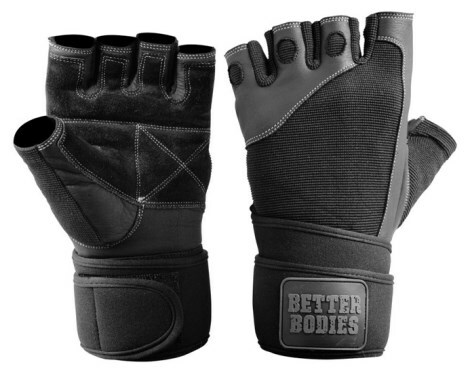 Köp Better Bodies Pro Wrist Wrap Gloves hos Svenskt Kosttillskott. Snabbt & fraktfritt! Ergonomiska träningshandskar för bättre grepp och skydd för händerna vid träning, med halvfinger-design. Tillverkad i tåligt läder och bekväm polyester. Extra stöd vid handlederna, anpassat efter tung styrketräning. Ergonomic developed gloves weightlifting gloves with strong wrist wrap, - when only the best is good enough! 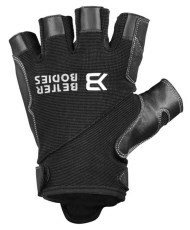 Reinforced double Leather constructed palm with foam padding for professional grip and superior durability. "Multi flex" elastic mesh on back of hand, between fingers and on thumb for best fit and breathability during heavy workouts! Neoprene wrist wrap with extremely good support! Adjustable Velcro closing for really good fit! 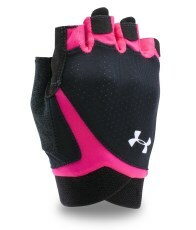 Exceptional contact and support with any gym equipment due to 1/2 finger design and wrist wrap! Made of the highest quality alanin cowhide leather, lined with polyester! Hand wash and air dry.